Somalia has faced lawlessness and strife during its decades-long civil war. As the country of 10.8 million continues to experience political and economic instability, its people are increasingly living outside of Somalia. New migrants are making their way to places like Europe, but they face a long and dangerous journey over land and sea. Hundreds of Somalis reportedly died in April 2016 while crossing the Mediterranean Sea and after crossing over land through Northern Africa. And as a result of its long civil war, many Somalis have lived outside the country for many years. Recently, though, Kenya pledged to remove Somalis living in refugee camps from within its borders, potentially sending hundreds of thousands of people back to Somalia who have not lived there for many years, or possibly elsewhere. 2The number of Somali refugees displaced by ongoing conflict continues to rise. In 1990, the United Nations High Commissioner on Refugees estimated that about 470,000 of the total Somali global diaspora (about 55%) was living in a temporary refugee situation. By 2014, that number had grown to 1.1 million – still about 55% of all Somalis living outside of Somalia. Even though refugee camps are meant to be temporary, some Somali refugees have lived in camps located in neighboring countries such as Kenya and Ethiopia for decades. 3 Almost two-thirds of the global Somali diaspora live in neighboring countries. At nearly half a million, Kenya hosts the largest number of Somali migrants (both refugees and nonrefugees) of any other country, according to UN estimates. Not far behind is Ethiopia with 440,000 Somali migrants. Combining Kenya, Ethiopia, Djibouti and Yemen (across the Gulf of Aden), nearly two-thirds of the world’s Somali migrants lived in neighboring countries in 2015. At the same time, Somalis have become increasingly dispersed across the world. In 1990, an estimated 90% of Somali migrants lived in the four nations near Somalia, a share that dropped to 64% by 2015. 4An estimated 280,000 Somali immigrants live in the European Union, Norway and Switzerland, largely due to a steady flow of asylum seekers. 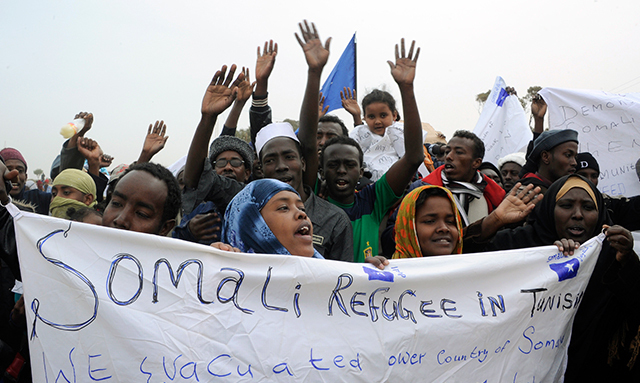 The EU, Norway and Switzerland are home to 14% of the world’s Somali migrant population. Since 2008, these countries have received nearly 140,000 asylum applications from Somalis, according to the EU’s statistical agency Eurostat. The annual flow of Somali asylum seekers has held relatively steady since this benchmark year, but their destination countries within Europe have changed. 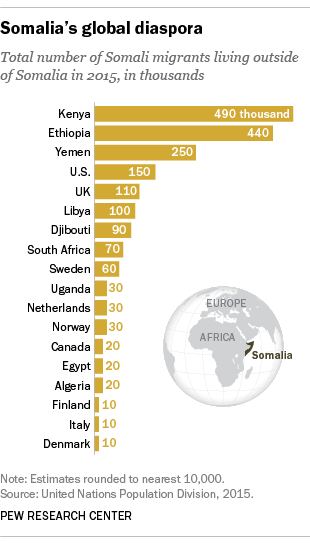 In 2015, Germany and Sweden received about half of these Somali asylum seekers. In earlier years, the Netherlands and Italy were more common destinations for Somali asylum seekers. 5The U.S. Somali immigrant community continues to grow. Estimates from the United Nations indicate that the total number living in the U.S. was around 2,500 in 1990, but had grown to between 140,000 and 150,000 by 2015. In all, the U.S. is home to about 7% of the world’s Somali migrant population. Between fiscal years 2001 and 2015, the U.S. admitted more than 90,000 refugees from Somalia, according to the U.S. Office of Refugee Resettlement. This refugee flow continues today, with nearly 9,000 refugees from Somalia entering the U.S. in fiscal 2015. The U.S. also approved 1,645 green cards in 2014 for Somalis sponsored by U.S. citizen immediate family members, according to the Department of Homeland Security.